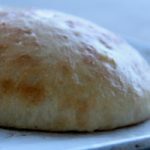 French peasant bread is such a great beginner recipe for making bread! It’s fool proof and turns out so tasty every time. I love my friend Tessa. And I love her cooking. Tessa brought this recipe to a dinner party at Christmas and I fell in love. It is super simple. 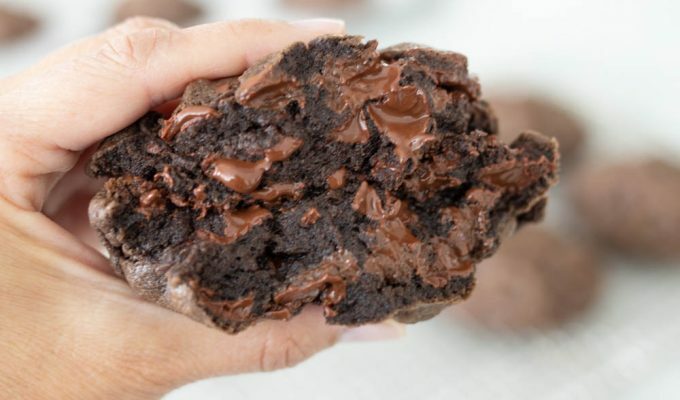 No kneading and no mixer required! How great is that? This recipe makes two loaves which is perfect for sharing on a cold winter day. Make one for your family and one to deliver to a friend who needs a warm loaf of bread in their life. Who doesn’t love a fresh loaf of bread out of the oven? I could eat this bread all day long. Slice it up and serve with butter, jam, or honey. There is no wrong way to eat this bread. It’s great with a salad for lunch or any dinner dish out there. Toast it and eat it for breakfast or make it with your favorite french toast recipe. So many delicious ways to use this yummy bread. Does making bread intimidate you? If it does, this recipe is for you! I promise it is super simple and you will 100% succeed! Start by placing the yeast, sugar, and salt in warm water and stir until dissolved. Add the flour and stir until combined. No kneading for this recipe- so easy! Cover the dough in the bowl and let rise for one hour or until it’s doubled in size. While the bread is rising, grease a cookie sheet and sprinkle with cornmeal. After the dough has doubled in size, separate it into two rounds and put it on the cookie sheet. Let the dough rise for another hour. Preheat your oven to 425 degrees, brush the top of the dough with melted butter, and bake in the oven for 10 minutes. After 10 minutes, reduce the heat to 375 degrees and cook for another 15 minutes. Brush with more butter (yes, more!) after you take it out of the oven. I really hope you give this recipe a try and love it as much as I do! Place yeast, water, sugar and salt in warm water and stir until dissolved. Add flour and stir until blended. Do not knead. Cover and let rise for one hour or doubled in size. Flour or grease hands and remove dough from bowl and place in 2 rounds on oiled cookie sheet ( or parchment paper ) sprinkled with corn meal. Let rise and additional hour. Brush top with melted butter. Reduce oven temperature to 375 degrees and cook an additional 15 minutes. Remove from oven and brush again with butter. Looks scrumptious…bread is my weekness…I will have to try this one. Thanks for sharing. Your loaf is beautiful. I could use a slice with a nice warm bowl of soup. Love that stuff with soup! Love this recipe.It's one of the best recipe I found soever. we all know the smell of good bread baking, like the sound of lightly flowing water, is indescribable in its evocation of innocence and delight. I really love this recipe. This recipe is really very interesting and informative. I love this recipe! It’s my go to for when I need some bread to go with dinner! I would like to bake this bread in a loaf pan; is that possible? Do I need to change anything? Hi Linda, yes you can definitely try this in a loaf pan, you may have to bake it a little longer. Thanks for asking!